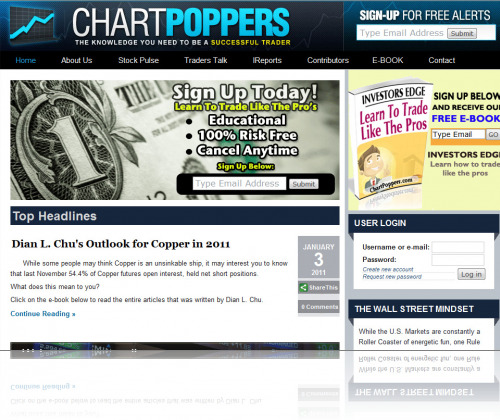 ChartPoppers.com is a free provider of stock market analysis from various sources, that provides financial content and opinion, but also includes comments from money managers, investment bankers, newsletters, and blogs. We believe that in order for a Trader to make good money with Penny Stocks, you need to be armed with as much information as possible, and at ChartPoppers we give you all of the tools and information to make a safe, informed decision that could yield some serious returns in a very short time frame! ChartPoppers has its own editorial staff, and features stock quotes from the NYSE, NASDAQ, AMEX, Pink Sheets and the OTC.